If you don’t know who Seb Rogers is then go and have a look at his website portfolio website and also his blog. 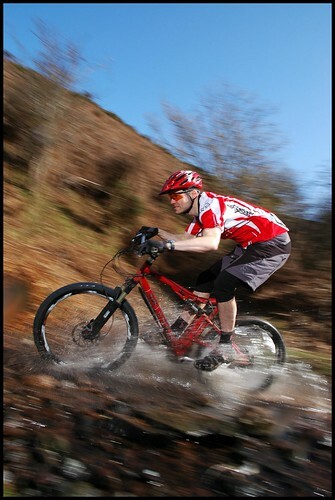 He’s a pro photographer specialising in shooting mountainbiking and runs a bi-yearly photography course to help people improve their mountainbike photography. Quite specific I know but it seems there’s plenty of us! I had been looking to get on this ever since I bought my D70 second hand in Dec ’07 and after seeing some results from the previous courses on Flickr as well as the previous write up from Seb. I missed the previous ones due to lack of funds and also through studying for my Part 3. This year I was determined not to miss it. Having a Birthday 3 days before Christmas helped – thanks Mum and Gran! So if you don’t want to read the whole review then my summary of the weekend is as follows. Great course and tuition which was completely customised to what we wanted to learn, great scenery and riding, great location, decent breakfast, a good local pub and a great cast of characters! They also had a dog to bother, who could want for more? Seb runs the course with Mike Davis from bikemagic.com who performs the modeling and pro elbow duties for the weekend. 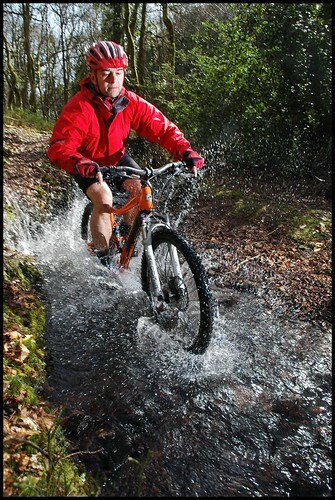 Al also joined us for the weekend to ride and model as his wife was doing the course. The course is based in a great B+B/bunkhouse in the small village of Bicknoller in the Quantock Hills area of Outstanding Natural Beauty. It really does desersve that title too. We all rocked up on the Friday morning ready to start learning, most of us looking a little sheepish not knowing what to expect, and not knowing anyone either. We chucked our kit in to our rooms and went upstairs for our introduction to the weekend. It soon became apparent that there was a wide variety of experience from someone who had never used a DSLR before to someone who shoots professionally as well as an accomplished landscape photographer and everything in between. All good! I’d done bit and bobs before with mixed results usually focus problems and not terribly exciting composition. I was here to correct some of that and move it on a few more steps. So after the usual pre-ride faff we hit the trails not far from the B+B. 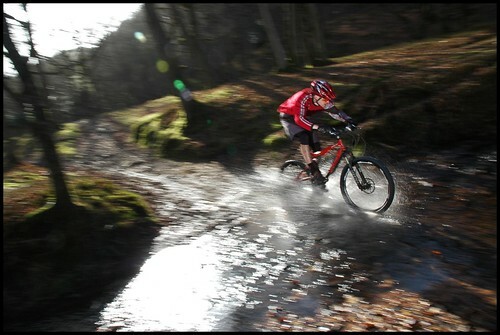 We started on a bit of straight-ish singletrack in pairs practicing panning with a rider and then swapping over. This was harder than it sounds and also pretty difficult to get the face sharp and get some sense of motion going on. Locking the rider to one part of the viewfinder and following them along was VERY hard at first. It made me realise just how much my eye used to wander around the viewfinder kind of re-evaluating the scene as it changed, not knowing what I wanted my shot to actually look like. Things got easier after the first few shots and settling at a comfortable shutter speed. After this we headed round the trail a bit and then hit the first of many many stream crossings. It was good to just try out a few different angles and just know that Mike & Al would happily ride through as many times as you want. Brilliant! Back at the B+B the pics were all downloaded and viewed on the screen. A huge homemade victoria sponge, fruit cake and shortbread awaited us. Happy faces all round. The whole lot was polished off whilst going through the images with a particularly valiant effort from Guy with six pieces of cake consumed! A few good shots from each of us but it wasn’t such a great day in terms of light. Seb mentioned that a one image would have worked well as a “Contents page” in a magazine. This kind of stuck and any vaguely similar image was called out as a contents page to much hilarity. Don’t you just love bike/photography jokes? :-) A bit of feedback and some tips about where we had gone wrong was given to each of us as well as asking us how well we thought we had done. Most of us said it was harder than we expected. Showers all round, then the pub for dinner. A decent dinner and all manner of chat from photography to bikes and back again. The waiter had a certain feel of Faulty Towers about him which certainly added to the night. Someone asked if they could have some ice cream with their desert. The answer… “No”. Customer service clearly not his strong point. Up and about to a beautiful day and clear view over the Bristol Channel as well as a superb breakfast with endless toast and coffee. What could be better. More fettling and faffing of bikes before a quick chat upstairs about what we’d be doing today. Todays assignment – manual exposure and histograms. We were also going further afield in the quest for some better shots and a bit more action for Mike and Al. We were heading for another stream crossing and headed up over the hill where we took yesterdays stream shots. Over the top and out in the open moorland. We quickly headed down some pretty sketchy steep descent before stopping for a bunch of friendly walkers who were amazed we were riding it. I was just amazed they were friendly. We came round the next corner to find a reasonable sized tree covering the spot we wanted to shoot at. It had fallen over and twisted around the trunk during the recent snow. All 9 of us tried to lift it out of the way which was never going to happen. Not to be defeated I borrowed a leatherman from Al and started cutting round the trunk. Fortunately Mike had a folding saw…… back at the B+B! Still after 20mins of scoring round the trunk with the leatherman we gave it a good push and it came off and out of the way. A nice bit of trail maintenance too. A bit of lunch and then we set to taking some more photos. We also had a go with a bit of remote flash just to complicate things further. After this we headed out to the next spot which was on top of the hill for some traversing shots of some lovely singletrack and some climbing shots of Mike. A little exposed up top so we headed over to a final stream crossing for the last shots of the day. I also tested out a new lightstand I’ve been thinking of using for a while. Feedback was again given with yet more cake. There had been a big improvement from the day before and some great shots from everyone. Still lots of critical analysis though. No lovin here! A final trip to the pub and the same waiter was there. The deadpan reply of “It’s you lot again” certainly added to the Basil Faulty nature of it all. The third and final day started off with an equally sunny day and more endless toast and coffee. What did we want to learn? “How to make little jumps, stunts and steep section look like they’re as scary as they are?” Also a bit of flash and some work on composition. All good things to learn. 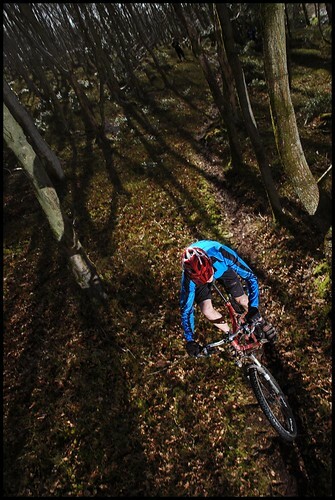 Firstly it was out to a steep rooty section for that perfect “extreme” setting. Unfortunately Mike went over the bars on the first go so probably not worth sessioning then. Next stop a lovely bit of singletrack in the trees. The light was perfect streaming through them. Seb had suggested getting higher or lower than normal eye height… so straight up a tree. Well I haven’t climbed a tree in years and it showed. So we’d done that one to death. 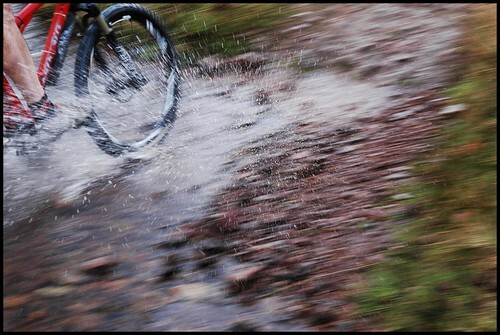 Along to the next spot which consisted of a long piece of singletrack with… you guessed it… a stream running past it. We got in to pairs and had a go at trying a little bit of sickness. Well all we did was a little plop off a ledge in to a stream but it looked pretty good with all the water flying out. Here’s Guy demonstrating. And that’s the longest blog post I’ve ever written! You should go. Needless to say that Monday (and Tuesday) was a real comedown.